May 31 UPDATE: SDFP‘s Barbara Zaragoza has posted a comprehensive follow-up to this story. Media Advisory from the National City Elementary Teachers Association. UPDATE 2/29/2017: The family strongly denies the charges brought by Border Patrol. A spokesperson maintains the allegations are a smear campaign. UPDATE 5/27/2017: Protestors gathered at 2pm on Friday, May 26th at Otay Mesa Detention Center. Several media outlets covered the protests and uncovered additional information. According to two reports, the Duarte parents were apprehended near their home, not near a National City school. In addition, 10 News reported: “Duarte says undercover federal immigration agents, in unmarked cars, showed up outside their home in National City Tuesday and arrested his parents. ICE denies that claim to 10 News. The report also says the parents have not been charged with any crime. They had no previous criminal record. 7 News San Diego reported a different story, explaining that Duarte and Perez have been charged with immigration violations, and are being processed for removal proceedings. According to U.S. Border Patrol, Duarte and Perez were suspected to have been working as stash house operators for a transnational human smuggling operation. They were both under investigation for their alleged involvement. Initial reports indicated that ICE detained NSD parents while they walked their children to Las Palmas school. NCETA has learned that the parents were arrested by Border Patrol at the home, in front of students. Regardless of the location of the arrests, NCETA believes that our students will be most successful when their families are kept together. There is another confirmed case in our school district of a mother who was deported within the last two weeks to Tijuana, leaving her son behind. NCETA calls on the National City community to support vulnerable families, and continues to demand that ICE or the Border Patrol cease and desist targeting families because of immigration status. 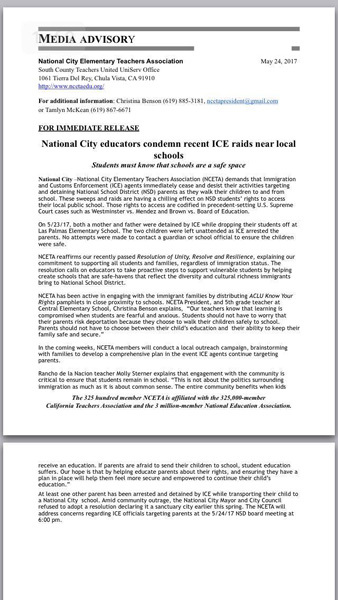 National City Elementary Teachers Association (NCETA) demands that immigration and Customs Enforcement (ICE) agents immediately cease and desist their activities targeting and detaining National School District (NSD) parents as they walk their children to and from school. These sweeps and raids are having a chilling effect on NSD students’ rights to access their local public school. Those rights to access are codified in precinct-setting U.S. Supreme Court cases such as Westminster vs. Mendez and Brown vs. Board of Education. On 5/23/17, both a mother and father were detained by ICE while dropping their students off at Las Palmas Elementary School. The two children were left unattended as ICE arrested the parents. No attempts were made to contact a guardian or school official to ensure the children were safe. NCETA reaffirms our recently passed Resolution of Unity, Resolve and Resilience, explaining our commitment to supporting all students and families, regardless of immigration status. The resolution calls on educators to take proactive steps to support vulnerable students by helping create schools that are safe-havens that reflect the diversity and cultural richness immigrants bring to National School District. In the coming weeks, NCETA members will conduct a local outreach campaign, brainstorming with families to develop a comprehensive plan in the event ICE agents continue targeting parents. At least one other parents has been arrested and detained by ICE while transporting their child to a National City school. Amid community outrage, the National City Mayor and City Council refused to adopt a resolution declaring it a sanctuary city earlier this spring. On Tuesday, May 24th in National City Francisco and Rosenda Duarte were ambushed by undercover ICE agents in unmarked cars as their children were getting ready for school. They have been in the United States for 21 years and have no criminal records, not even speeding tickets. They are volunteers in the community. Yet they were taken. Children were left at home crying. Francisco Jr. a 19 year old college student was suddenly thrust into taking care of his 3 younger brothers and sisters. These children need help with their day to day needs. We will be representing their legal needs and working on getting the parents out of detention. The family has set up a gofundme account to try and earn money for their rent, utilities, food, court fees, bail costs, etc. Francisco Duarte is being held at the Chula Vista Detention Center and Rosenda Perez is being held at the Otay Detention Facility. There will be an action planned at the Chula Vista facility tomorrow to demand their return to their children. Salas, Chula Vista and the South Bay continue to take a backseat to more powerful politicians and regional priorities. It’s particularly true when it comes to SANDAG, the regional planning and transportation agency. 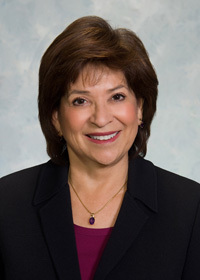 Salas said she wasn’t able to get a leadership position at SANDAG, even though she was the only applicant. –The Saburo Muraoka Elementary School will have their ribbon cutting ceremony on Friday, July 14. The new school commemorates Muraoka, a successful farmer who lost his home, farm and business during WWII when he was sent to the internment camp alongside 100,000 people of Japanese ancestry. After the ordeal, Muraoka returned to Chula Vista and gained local renown as a celery and cucumber grower who shipped his produce nationwide. –A stranger driving in a white pickup trick tried to kidnap a Southwestern College student at about 10:15 a.m. The woman broke free from the man who then sped away onto H Street. (Imperial Beach Patch) The kidnapping attempt comes during a time when Southwestern College is addressing campus assaults. As part of this process – and in an effort to hear from you – the United States Trade Representative (USTR) has published a Federal Register Notice (FRN) soliciting public comments on the Agreement – which will assist the Administration in identifying its negotiating priorities. We encourage you to share the link and submit comments. The FRN comment period will be open through June 12, 2017. To submit comments, or to request to participate in a public hearing on June 27th at the U.S. International Trade Commission in Washington, DC. click here. Afghanistan at a street sign dedication ceremony. The ceremony will take place on Friday, May 26, at 11a.m. at the corner of Heritage Road and Santa Victoria Road. Seven streets will join over 85 others in Chula Vista presently named to honor Chula Vista’s veterans. The street names to be dedicated are: Salem Bachar, Iraq War Veteran; Michael Idanan, Iraq War Veteran; Kristofferson Lorenzo, Afghanistan War Veteran; Michael Martinez, Iraq War Veteran; Joshua Mattero, Iraq War Veteran; Curtis Spivey, Iraq War Veteran; and Charles Wyckoff, Jr., Afghanistan War Veteran. The ICE raids are brutal, cruel and gratuitous. It is still not clear what we can do stop them and provide support for individuals in ICE custody. would forming a group providing the service of dropping their children to schools for them will help on this situation? We’ve seen No. 45 tell his audiences to throw people out of public spaces for protesting, and heard him talk about being able to walk down 5th Ave. and shoot people without losing a vote. Gianforte in Montana has been elected (albeit narrowly) after jumping a reporter who dared to ask him a question. The right will say all this violence is caused by The Left. Their own words and deeds make clear the right has crumbled into fantasies of personal supremacy. Please post, if you can, more information about the action that will take place tomorrow at the detention facility. It turns out the “war against terrorism” starts by removing Trump and his strange group of admirers from power. A reality tv star. Are you kidding? No “christian” president would condone such a heinous program of hatred. The country is being taken over by a ruthless ignorant dictator and his band of unethical followers. They have declared war on the people. Mayor Ron Morrison, council members Albert Mendevil and Jerry Cano previously voted no to a sanctuary city resolution in National City. Now we are seeing the consequences of their actions as residents all over National City are being targeted by ICE with the help of our police department. With a population made up of around 80-90 percent Latino and Asian, many are immigrants, this is outrageous. Thanks to the two council woman Alejandra Sotelo Solis and Mona Rios, they have been championing safe guards and justice for immigrants. However they are only 2 of 5 votes. Andrew — can you verify that the police department was involved or assisting? So, if the parents were ‘suspected’ of being involved in smuggling, does this justify their detention? Or is extra-judicial kidnapping now an acceptable policy? Regardless of legal status, people do have certain rights on US soil.